A paper published today in Quaternary Science Reviews reconstructs temperatures over the past 10,000 years from two lakes in Iceland and finds temperatures peaked during the Holocene Climate Optimum 8,000 years ago, but have since declined by a remarkable ~ 12C to the end of the record in the year 2000. The paper also demonstrates abrupt natural climate change of ~10C warming occurred over only 100 years from 8,000 to 7,900 years ago. Top two graphs show temperature proxies from two different lakes in Iceland. Bottom graph is a composite of the two lakes, and shows ~12C temperature decrease from 8,000 years ago to the end of the record in the year 2000. Precisely-dated decadally-resolved Holocene climate records from two Icelandic lakes. Multiproxy paleoclimate composite reveals delayed response to insolation maximum. 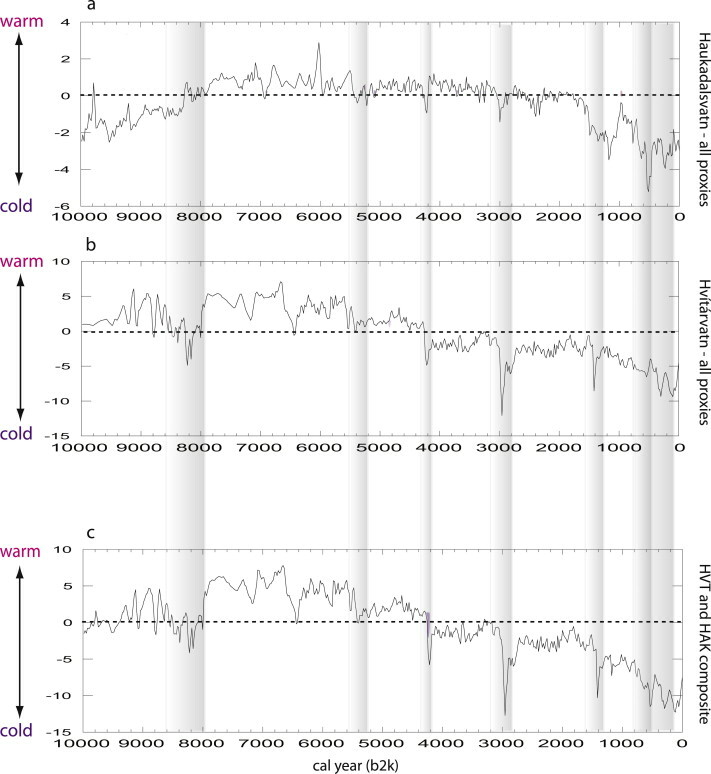 Abrupt cold perturbations 5.5, 4.2, 3.0, and 1.5 ka climaxing in the Little Ice Age. Synchronized lake records provide a climate template for the northern North Atlantic. Two high-sediment-accumulation-rate Icelandic lakes, the glacial lake Hvítárvatn and the non-glacial lake Haukadalsvatn, contain numerous tephra layers of known age, which together with high-resolution paleomagnetic secular variations allow synchronization with a well-dated marine core from the shelf north of Iceland. A composite standardized climate record from the two lakes provides a single time series that efficiently integrates multi-proxy data that reflect the evolution of summer temperatures through the Holocene. The first-order trends in biogenic silica (BSi), δ13C, and C:N rise relatively abruptly following deglaciation, reaching maximum values shortly after 8 ka following a complex minimum between 8.7 and 8.0 ka. The Holocene Thermal Maximum (HTM) in the lakes is marked by all proxies, with a sharp transition out of the 8 ka cold event into peak summer warmth by 7.9 ka, and continuing warm with some fluctuations until 5.5 ka. Decreasing summer insolation after the HTM is reflected by incremental cooling, initially ∼5.5 ka, with subsequent cold perturbations recorded by all proxies 4.3 to 4.0 ka and 3.1 to 2.8 ka. The strongest disturbance occurred after 2 ka with initial summer cooling occurring between 1.4 and 1.0 ka, followed by a more severe drop in summer temperatures after 0.7 ka culminating between 0.5 and 0.2 ka. Following each late Holocene cold departure, BSi re-equilibrated at a lower value independent of the sediment accumulation rate. Some of the abrupt shifts may be related to Icelandic volcanism influencing catchment stability, but the lack of a full recovery to pre-existing values after the perturbation suggests increased periglacial activity, decreased vegetation cover, and glacier growth in the highlands of Iceland. The similarity in timing, direction and magnitude of our multi-proxy records from glacial and non-glacial lakes, and from the adjacent marine shelf, suggests that our composite record reflects large-scale shifts in ocean/atmosphere circulation throughout the northern North Atlantic.